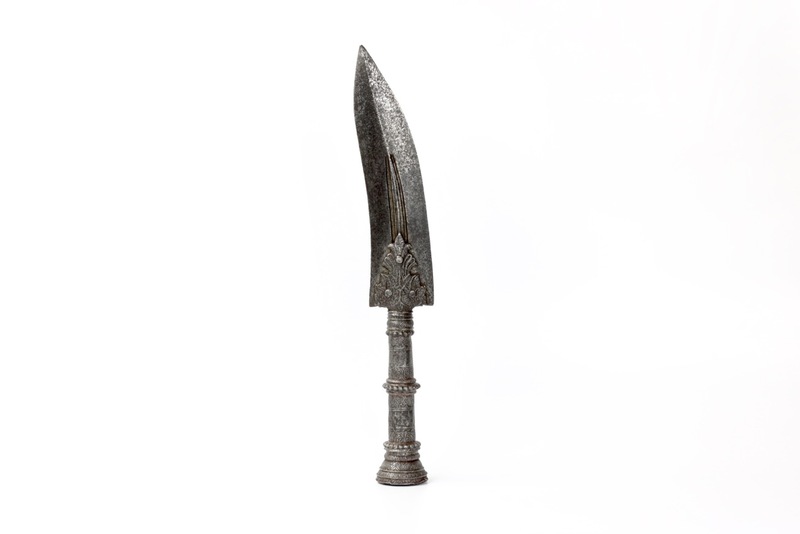 A large south Indian spearhead called sang , sanku or sanger . It consists of a large, thick and wide blade with a slight bend. I believe this was to make the weapons more versatile and make it better for the cut as well. 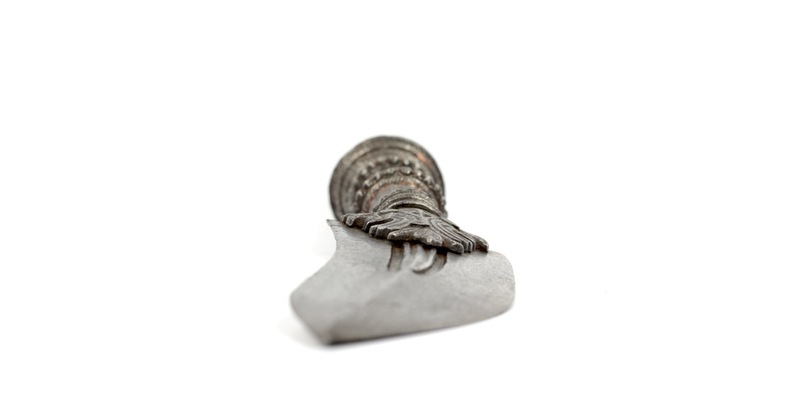 It has four narrow but deep grooves on either side. 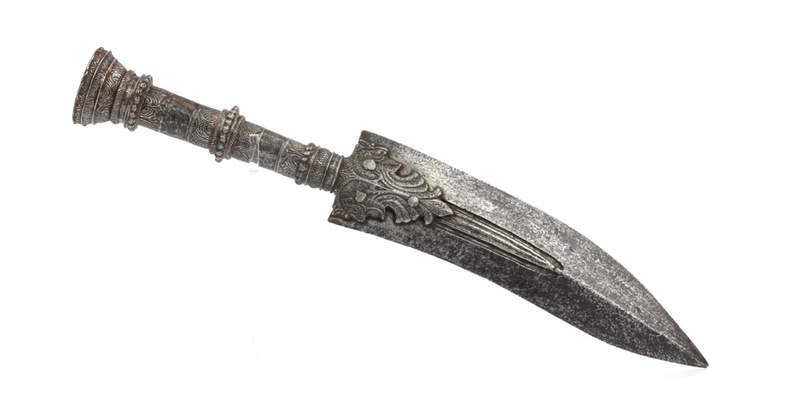 The blade shows signs of a forge folded construction. 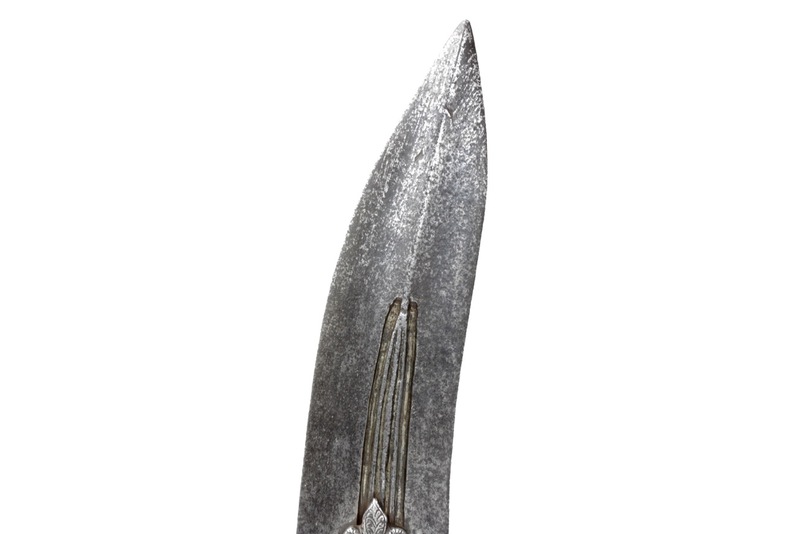 The blade is held to the socket by means of two langets, attached to the base of the blade with three rivets. 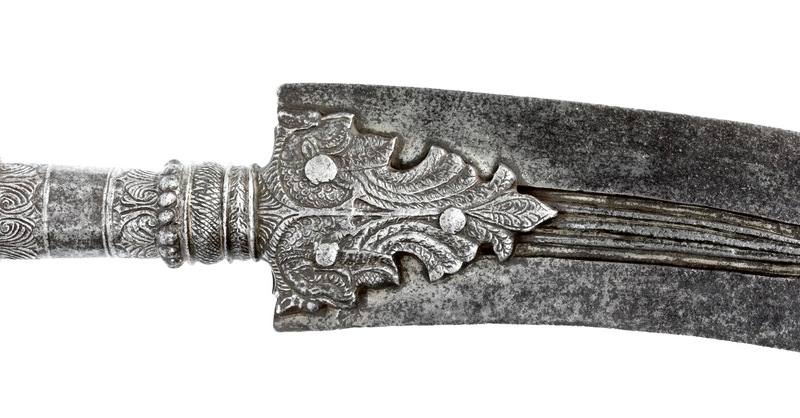 The langets are chiseled with designs of yāli in bird form.1 Their heads are on either side of the langet while their bird-like tails join to form the palmate motif projecting forward. 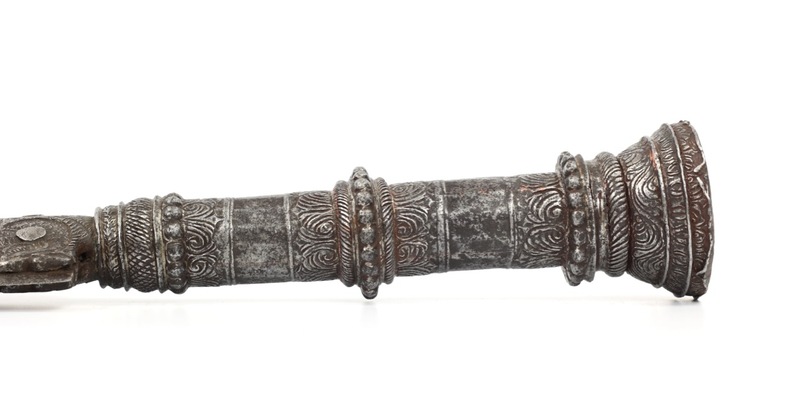 This is a typical motif found on various types of weapons from the Tanjore armory. 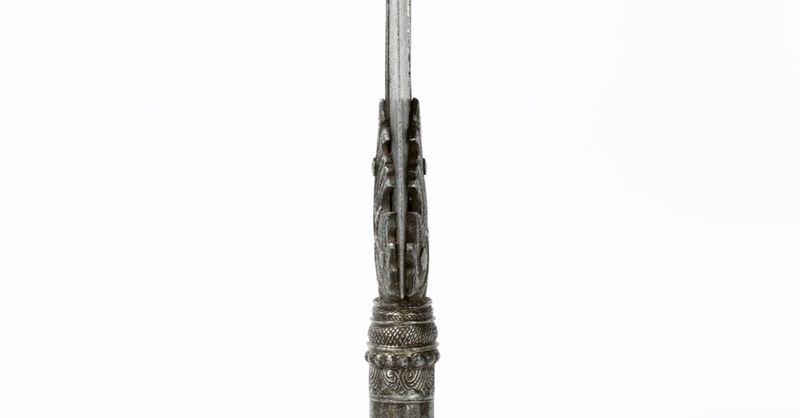 The socket is entirely decorated with chiseled and engraved motifs. 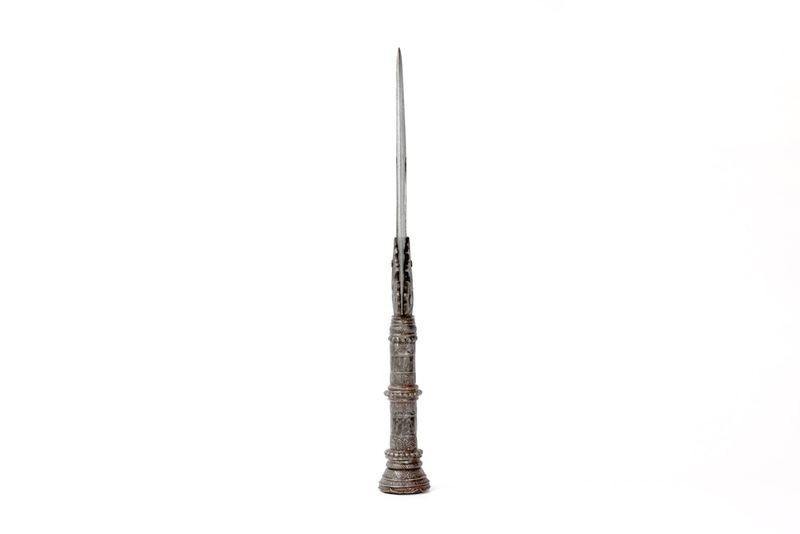 It has three bands of beaded rims and a large conical mouthpiece where the shaft is inserted. 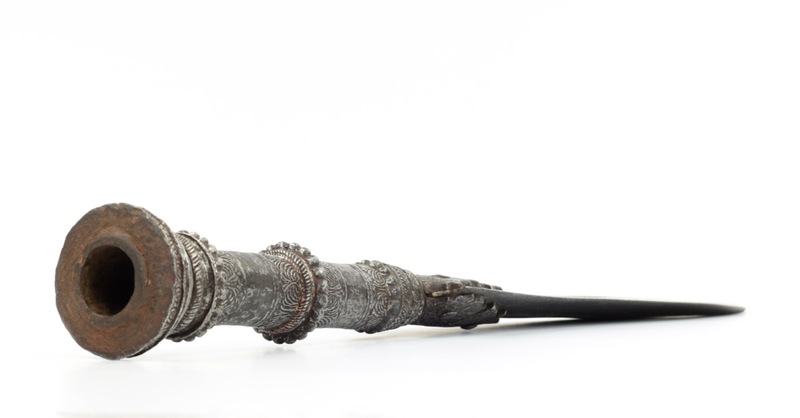 Between the rims the shaft and mouthpiece are decorated with geometric and floral patterns. 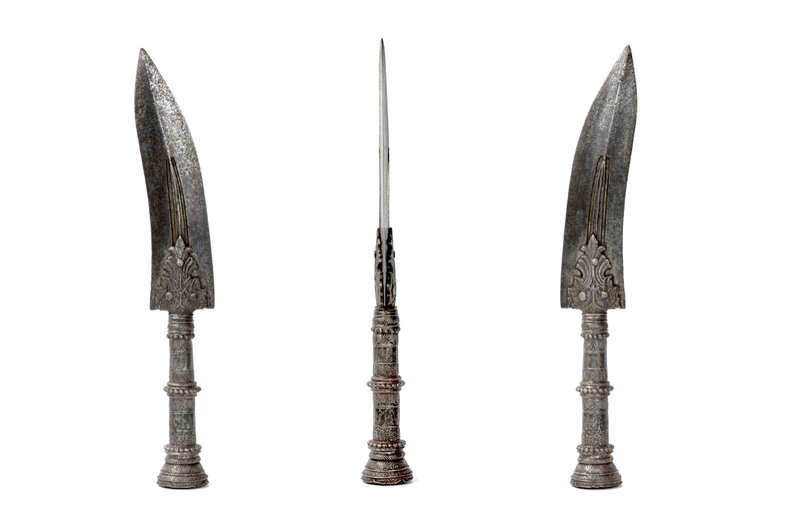 Comparable examples of this type of spearhead are somewhat rare. 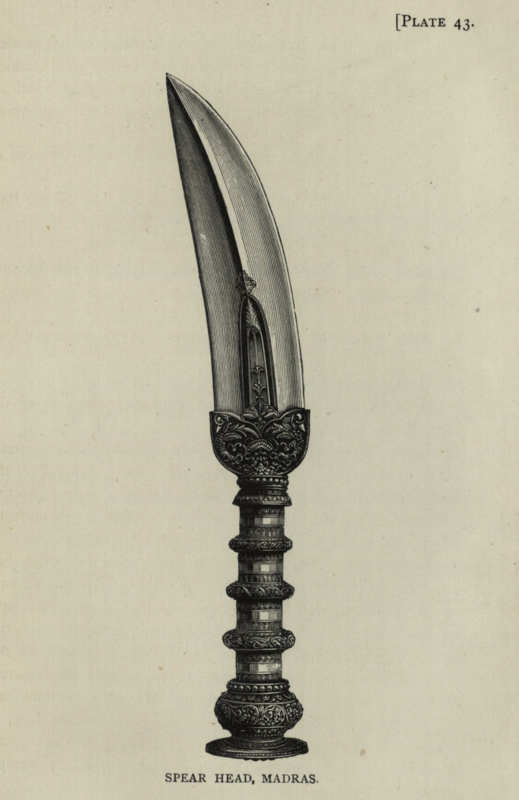 Most south Indian spearheads, although exhibiting many similarities to ours, are of a type with a rounded base. Spearhead published in Birdwood, 1880. An example nearly identical to the one illustrated above was in the Richard R. Wagner Jr. collection. It was auctioned at Bonhams Knightsbridge, 29th of April 2016. Lot 19 for €3,211. Another, from the Jacques Desenfans Collection, was auctioned at Bonhams New Bond Street, 10th April 2008. Lot 284 for €6,306. 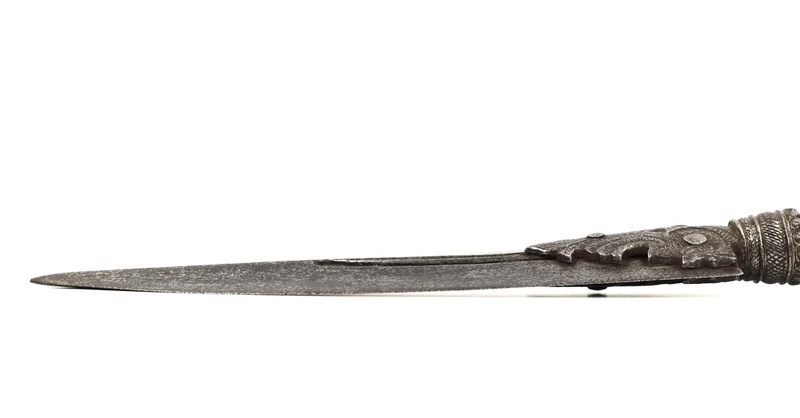 Most such spearheads found in collections are thought to date from the 17th century. Those with the rounded back tend to have Madras provenance. I suspect the type I have here is from a different place, within the same general cultural sphere. A hint towards origin may be in the beaded work seen on the socket of ours, which reminds strongly of similar beaded borders on arms coming from the Tanjore armory. The yali depicted on the base of ours is a very common motif on Tanjore arms, and was the royal insignia of the Vijayanagara empire which lasted from 1336–1646 A.D. 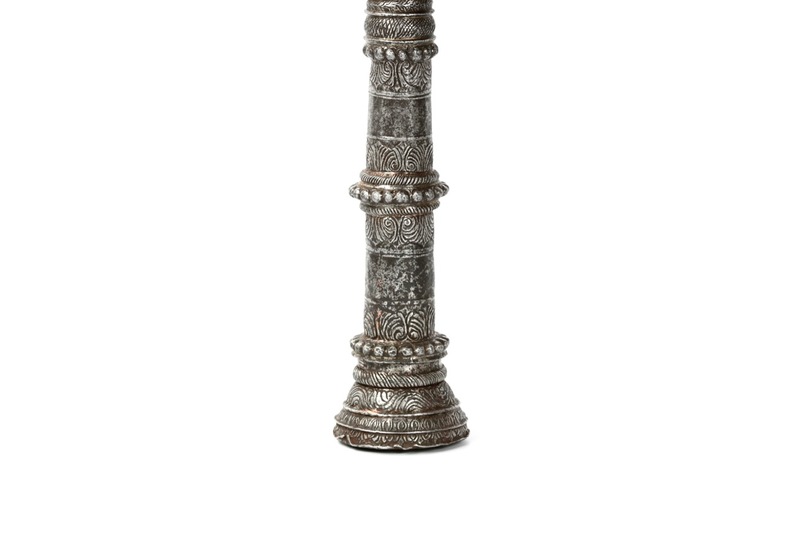 I would therefore think the piece is most likely also from Tanjore. 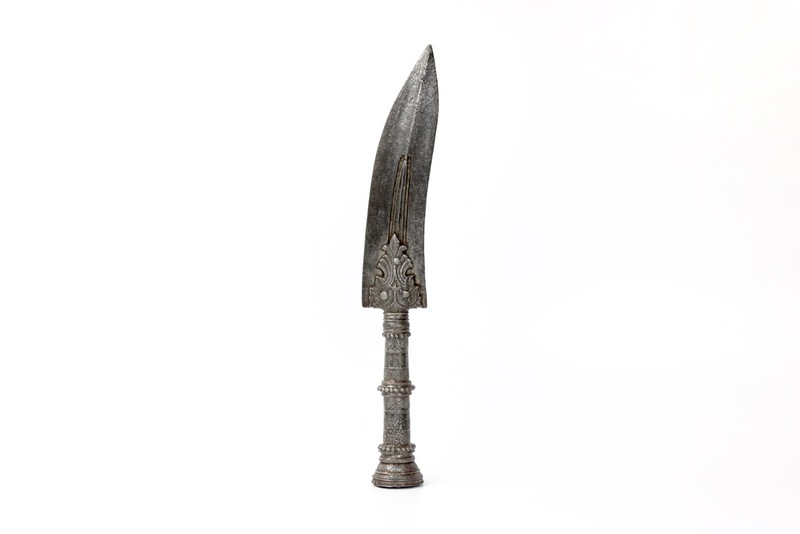 A very rare type of south Indian spearhead, probably from Tanjore. 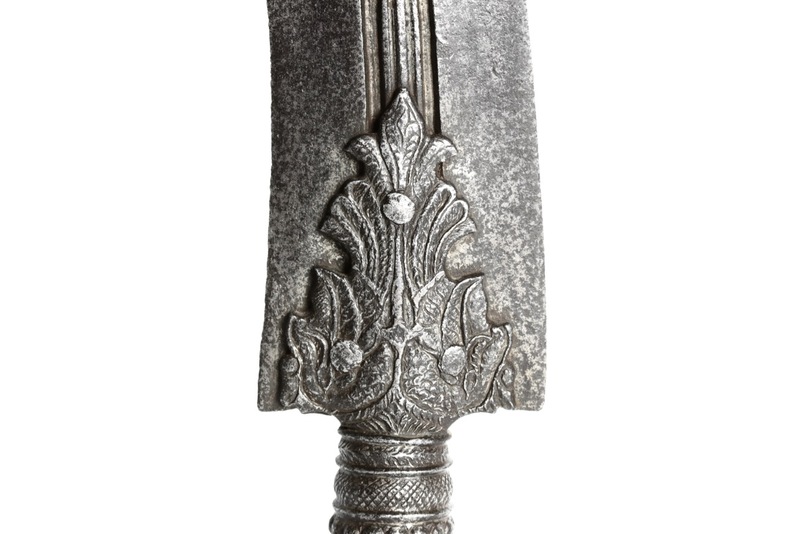 It is in good condition, retaining its original surface patina and the original contours of the heavy blade. An impressive piece. 1. Yāli are mythological creatures common in the arts and architecture of South India. They are composite animals, with a dragon-like head on lionesque or bird-like bodies. According to Brill's Encyclopedia of Hinduism the yāli serves as a conveyance of Kālī (a Hindu goddess), Durgā (a Hindu goddess) and Budha (a Hindu God associated with the planet Mercury). See: Brill’s Encyclopedia of Hinduism Volume V Brill, Leiden, 2013. Page 33. 2. See: C. Purdon Clarke; Arms and Armour at Sandringham: The Indian Collection Presented by the Princes, Chiefs and Nobles of India ... in 1875-1876 . The spears feature on pages 4, 5, 8, 9, 10, 11, 12, 13, 14, 15, 18, 19, 23 and 25. Their catalog numbers: 46, 47, 103, 104, 131, 155, 156, 186, 187, 236, 237, 319, 320. 3. Robert Elgood; Hindu arms and Ritual , Eburon Academic Publishers, Delft, 2004. Page 194. 4. George C.M. Birdwood; The Industrial Arts of India Vol II , Chapman and Hall LTD, 1880. Pages 12-13. 5. Robert Elgood; Hindu arms and Ritual , Eburon Academic Publishers, Delft, 2004. Page 194.